Dean Burton presents Elizabeth Popernik Loden with Thomas A. Crowe Alumnus Award. The 2017 School of Applied Sciences Career Fair ended with a Networking Reception sponsored by the University of Mississippi Alumni Association. The presentation of the Thomas A. Crowe Outstanding Alumnus Award. The award honors an Applied Sciences alumnus whose professional, leadership, and service achievements are considered meritorious. 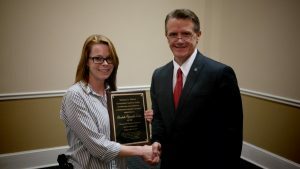 This year the award was presented to Elizabeth Popernik Loden. Loden received a Bachelor of Science in Criminal Justice degree in 2011, while currently working on her master’s degree in the same field. She has been a probation/parole agent with the Mississippi Department of Corrections since 2012.